Poppy is a wonderful mix of bohemian and chic. It is a chiffon gown that works for church service in the country as it is for a ceremony in the city. 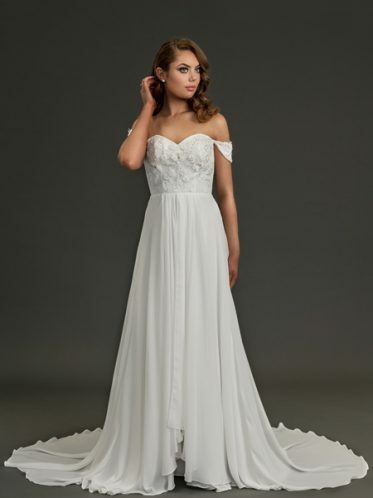 Go all out and wear to a wonderful debutante ball or other formal event. 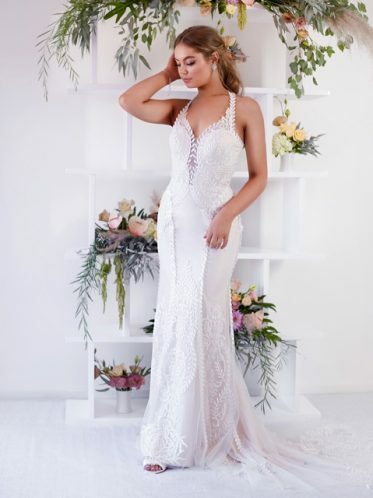 The spirit of this off the shoulder style makes it unique for the occasion as who’s wearing it. Someone that is drawn to whimsy, fairy tales, and vintage charm. Poppy is one part down-to-earthiness and one part vintage fashion. 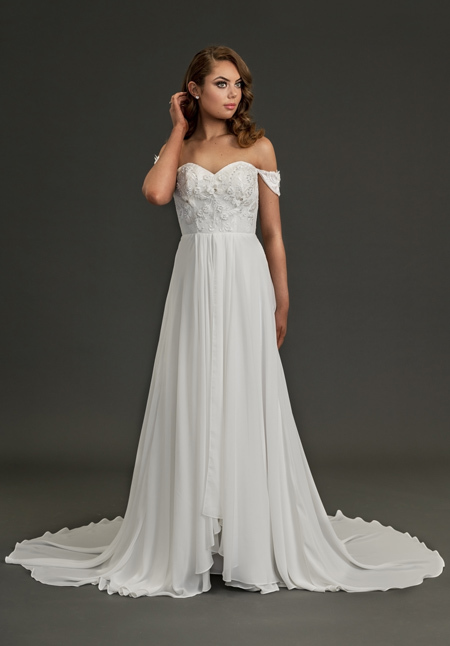 A corseted lace bodice with 3D lace is uniquely off set by off the shoulder straps. A simple ivory ruffle chiffon skirt flows from the bodice to rest on the floor in a medium length train. The effect is quirky and generous, streamlined and adorned. With such a unique design the accessories can be interesting as well. Our modern Myra thongs or Donna shoes still let the gorgeous train stay centre stage, while offering little peeps of their crystal embellishments. As for jewellery, our Hollywood earrings are arresting in themselves, then draw the eye downwards towards the intricacy of a boldly designed bodice. We pride ourselves on our Australian designs and our quality standards. We also offer in store alterations on your bridal gowns.